Whether you’re struggling with obesity, diabetes or any other inflammatory condition, the best way to overcome all these health concerns and live a quality life is the Ketogenic diet. Also known as Keto diet, this is a low carb, moderate protein, and high healthy fat diet. It focuses on producing ketones in the liver for energy. Let’s take a closer look at how this diet works to achieve good health and keeping medical conditions at bay…. A diet rich in carbs like rice, pasta and potatoes tend to generate glucose and insulin in the body. The body then uses glucose instead of burning fat to produce energy. And you know what that means? Yes, you got it right fats are stored in the body thereby pushing us towards obesity. On the other hand, Ketogenic diet counters this process. As the diet in low in carbs, the body goes into the state of ketosis. Ketosis is a process that is initiated by the body to help us survive when the intake of food is low. It produces ketones by breaking down fats in the liver. Furthermore, if this diet is followed religiously on a daily basis, it can force the body to go into this metabolic state and continue to burn ketones as its primary source of energy. Studies show that Ketogenic diet offers numerous health benefits, that too, in a smart way. Unlike other diets, the Keto diet focuses on carb starvation, not calorie starvation. This means you burn fat smartly without losing energy and saying no to good things in life. As the body becomes accustomed to burning health fats as its main fuel source it makes the liver produces ketones in higher level which are water soluble fats that in comparison to carbs burn more efficiently. As you go on Keto diet, you restrict yourself from non-fiber carbs and help your body burn stored fat. This helps in your weight loss efforts. The anti-inflammatory benefits of this diet are endless. When our diet is rich in carbs and sugar, we produce more glucose which further leads to high ROS (reactive oxygen species) and free radicals that cause inflammation. But in Keto diet you actually burn ketones which lower the production of free radicals and ROS thereby reducing inflammation significantly. It’s important to understand here that when the body uses glucose as energy source it causes blood sugar to increase thereby causing insulin resistance and even putting you at risk of Type 2 diabetes. However, when you switch to a Keto diet you can easily lower the insulin level in your body as the body no longer uses glucose as its primary energy source. Also, as it uses healthy fats, there is practically no negative effect on your blood sugar level thus helping you keep your blood sugar intact. Free radicals and ROS can result in brain fog by damaging the mitochondria. But if you opt for a Ketogenic diet, you can easily repair the damaged mitochondria and improve mental clarity. 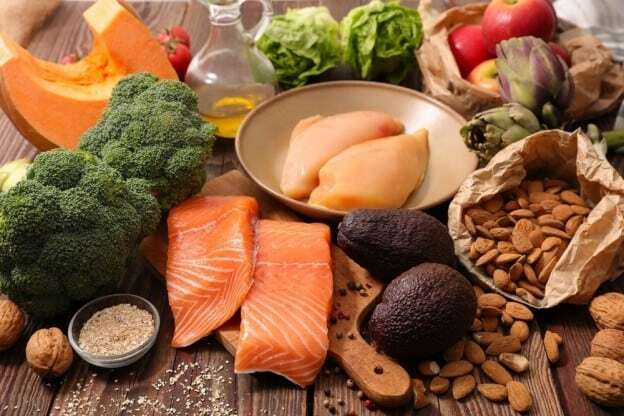 Though the diet plan is variable from person to person and the goals you want to achieve, the basic idea revolves around a diet that is rich in healthy fats such as avocados, coconut oil, wild Alaskan salmon and raw cacao butter. Also, should include high amounts of fiber like green leafy vegetables, and high quality protein like meat (fish, lamb, beef and poultry). Make sure to avoid grains, sugar, tubers and fruits. For a proper and personal Ketogenic diet plan, get in touch with me and check out my Everything Keto page!